SOUTH SHORE — There is a stretch of private land rarer in Chicago than a private beach, but it is almost impossible to see. That's because it is entirely underwater — meaning its owners literally lay claim to a piece of Lake Michigan. The land is 300 feet from the shore, just south of the South Shore Cultural Center. It appears to be the only private property in Cook County that is completely underwater. The story of how the land — which has its own mailing address and Cook County PIN numbers — ended up underwater began exactly a century ago after it was doused by what one newspaper dubbed a "hurricane." It remains private because of the failure of two acts of the Illinois Legislature and a very persistent developer. 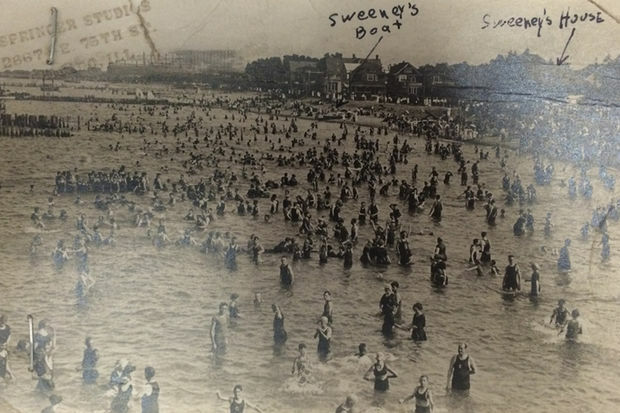 In 1917, the stretch of the shoreline between the South Shore Cultural Center and Rainbow Beach was a neat row of lakefront cottages along two private beaches, Manhattan and Nichols beaches. It was the home of middle-class families that had risen to high-ranking management positions in local government, utilities and other businesses, but weren’t the titans of Chicago’s economy that were building lavish mansions farther north in Kenwood. The best houses fronted Lake Park Avenue, a partially completed street that at the time was a block east of South Shore Drive. The street ran from 71st to 79th streets, although it was only paved south of 74th Street. It sat with a natural bluff on its western side and Manhattan Beach on the other. But on Nov. 1, 1917, a huge storm hit the lakefront. 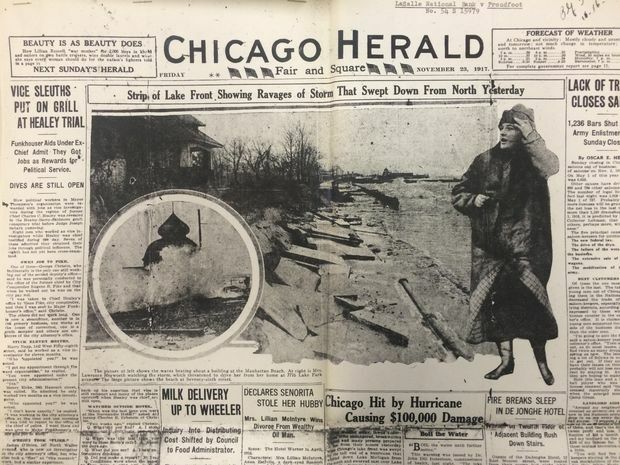 The storm was so devastating that the Chicago Herald called it a "hurricane" and reported that in 36 hours it caused upward of $100,000 dollars in damage, or about $2 million adjusted for inflation. Matt Friedlein, a meteorologist with the National Weather Service, said the storm occurred before detailed records existed of such events, but he said a hurricane would have been impossible. By definition hurricanes are tropical cyclones with sustained winds over 74 mph. However, fall storms from the Eastern seaboard can bring tropical storm winds upward of 60 mph, he said, which would easily have been enough to knock over trees and rip a roof off a house. "Those winds build big waves," Friedlein said. So big that homes were washed away. Frank C. Sweeney, a retired superintendent from the Lake Street Post Office, lived at 7650 S. Lake Park Avenue from 1914 until 1918, when his house was condemned. Sweeney testified in a 1954 court case that the shoreline up to his doorstep literally disappeared into the lake during the two-day storm. The storm “tore away the property there, about 150 feet of the shoreline,” Sweeney said, according to records of his in testimony in Cook County Superior Court for a case about a property dispute. The front page of the Herald shows waves had pushed a pile of broken concrete onto Sweeney’s doorstep. 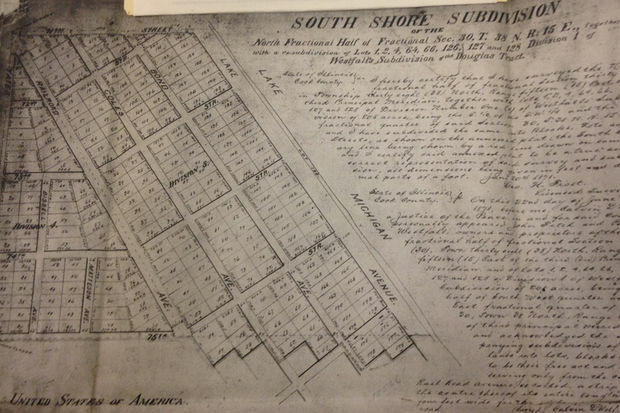 Lake Park Avenue — which was originally known as Lake Avenue and can be seen on maps of the South Shore subdivision dating to 1888 — was completely swallowed up in the storm. The two privately owned beaches, which were just east of Lake Park Avenue and stretched from 71st to 79th streets, also were submerged. The current owner bought the 29,250-square-foot property, that is at its widest about 15 feet, in 2010 for an undisclosed amount in a tax sale, according to Cook County Recorder of Deeds records. The owner, who lives on the lakefront near the submerged land and declined to be named, said she's not sure if it's worth much money, but it's valuable to her. "When you have a view, you want to protect what would block your view," she said. She said she was unaware of the history of the property, but after several decades living on the lake, has seen fall storms where crashing waves can send spray from the lake three stories in the air — waves that can move stone. "We would see these cobblestones that the lake brings you in a storm; they would just be rolling across the lawn," the owner said. The owner pays about $290 a year in property taxes to hold on to the parcel. "You just get a tax bill. I don't know if they even know it's underwater," she said. She said she has no plans to build on the underwater property. There is a second shorter stretch of underwater property that was likely part of Nichols Beach that is owned by Clarence Walsh of Jacksonville, Fla., according to property records. He could not be reached for comment. 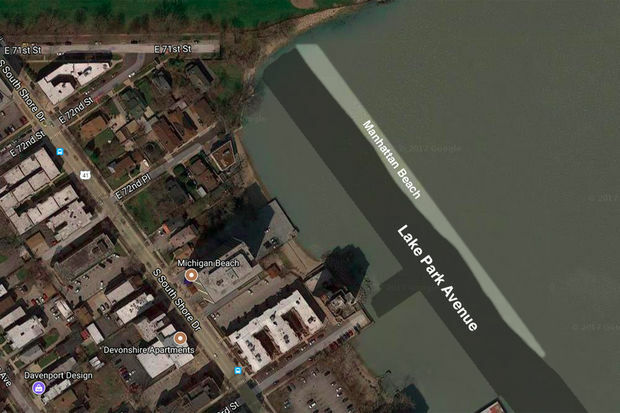 The two properties are the only two in the city known to be completely cut off from land. 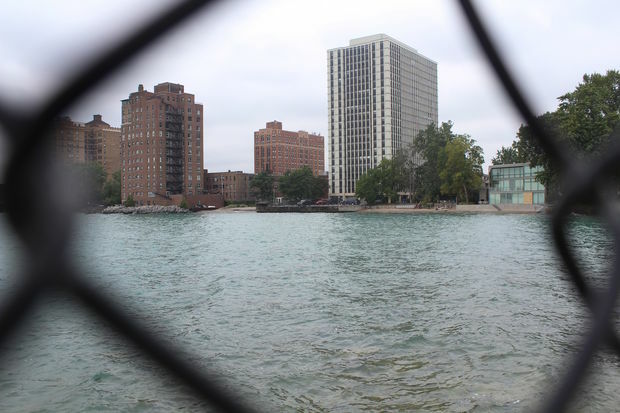 No one would own any of the underwater land if developer Henry Dubin of Dubin and Dubin Architects didn’t want to build a $5.5 million high-rise condo building 140 feet out in the lake in 1954. Lake Terrace, at 7337 S. South Shore Drive, sits with its eastern seawall on the boundary of where Lake Park Avenue once was. To build there, Dubin’s attorney had to convince a judge that he could still buy the land nearly 40 years after it had gone underwater. In most situations, if the lake erodes a section of the lakeshore, whatever goes underwater becomes property of the state. And the Illinois Legislature had in 1903 and 1931 ordered any remaining claims to the underwater property in South Shore be given over to the Chicago Park District. Dubin’s attorney, Jacob Grossman, was able to successfully argue that a storm isn’t the same as natural erosion and the owners always have a right to rebuild — even now. 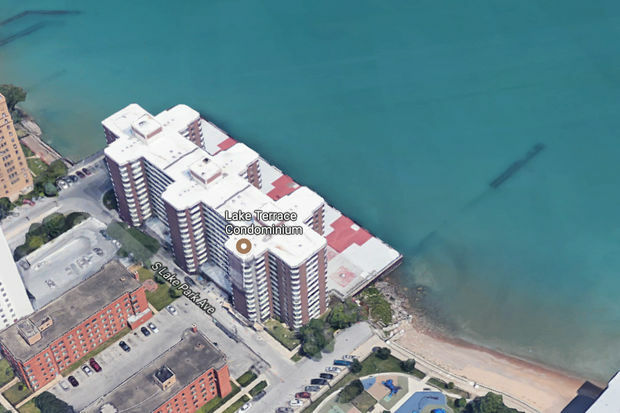 When the judge agreed, Dubin got to build his building literally into Lake Michigan, which now laps at the metal base of the property.